Fits all jeep wrangler CJ YJ TJ JK JL models. Remove hard top quickly without tools and improve appearance at the same time. NO TOOLS REQUIRED: Friendly thumb screw simplified hardtop removal. Fasten in seconds to factory attachment points. 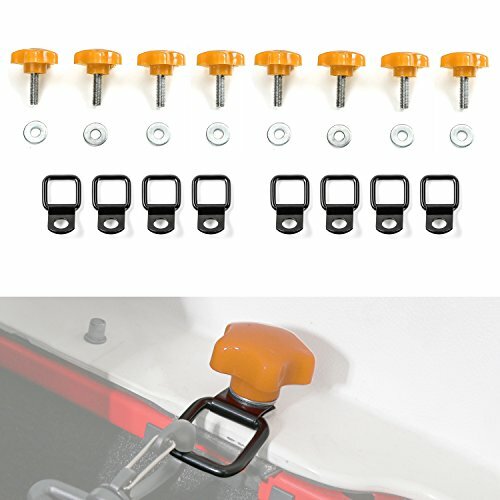 NO TOOLS REQUIRED: Friendly thumb screw simplifies hardtop removal. Fasten in seconds to factory attachment points. View More In Tops & Roofs. If you have any questions about this product by Jecar, contact us by completing and submitting the form below. If you are looking for a specif part number, please include it with your message.